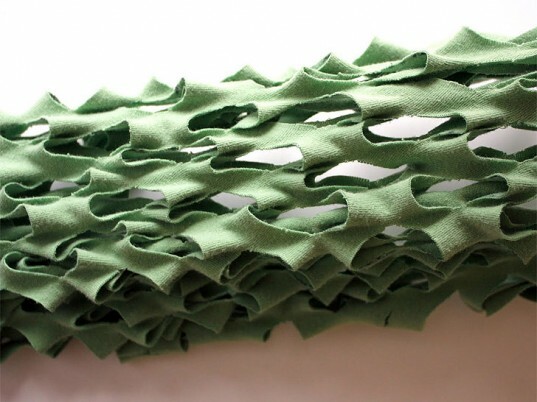 Produce mesh bags are the new reusable shopping totes, but why buy when you can make your own for next to nothing? 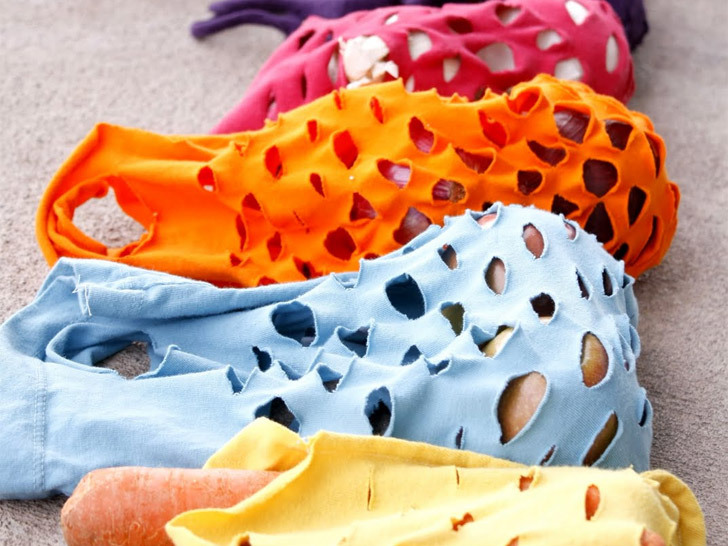 Delia Randall of Delia Creates shows us how to recycle an old T-shirt—you know, the one with all the moth holes and mystery stains—into an adorable veggie carrier. "I'm not the most green person," she tells Ecouterre. "But I do believe in taking care of our earth, and I think the point is to try. The more I try to repurpose old materials and cut down on waste, the easier it gets to be more eco-minded. And every effort counts, even if just a little bit." Did we mention these bags are off-the-charts cute, too? Cut through both layers so you have two identical pieces. 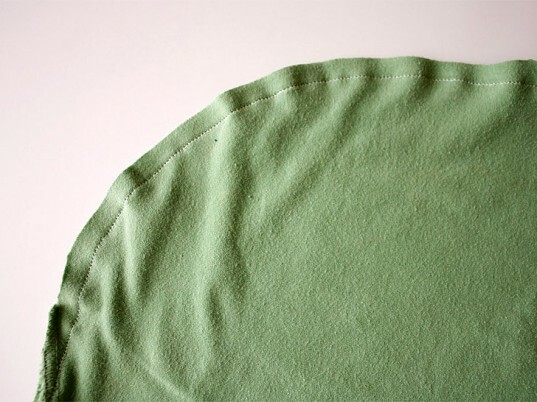 You can leave the shirt’s hem intact or snip it off. Stitch the two pieces together all the way around, leaving the bag’s opening untouched. 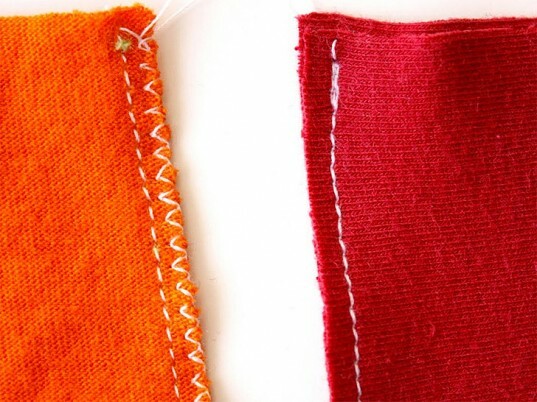 To prevent fraying, either serge or apply a narrow zigzag stitch to the edge. 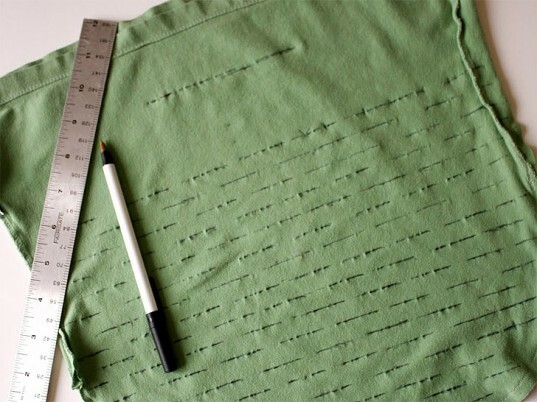 Use a ruler and ballpoint pen to draw dashes across the fabric. Important: Leave room four inches from the top for your handle. 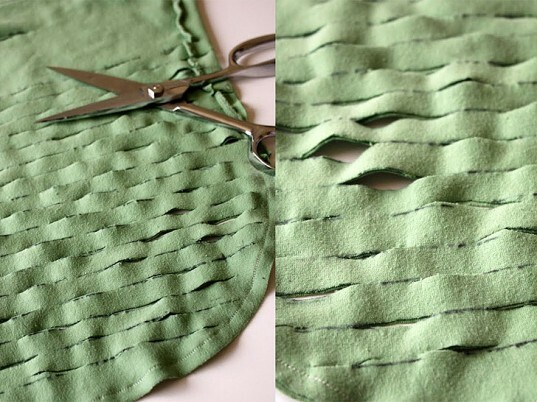 Using scissors or a rotary cutter, snip along the lines, making sure to stagger your cuts. Cut a longer slit two inches from the top—this will be your handle—and shape the sides if you wish. That’s it! 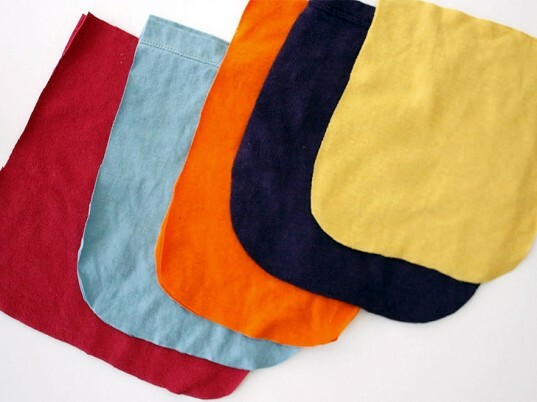 If you wash and dry your bag, the slits curl up a bit and it looks even better. You can use them for produce, as the name implies, or at the beach for your sandals. love this!so innovative and fun! 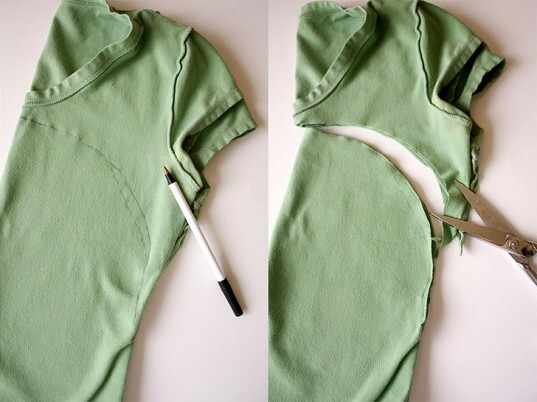 Just tried this - turned out great despite the tshirt I used being crappy and somehow uneven even before I cut into it! Thanks for the great tutorial and lovely pictures! O M Gosh! I have to DO this! AND pass it on to people I know who really have the creative ability to make some wonderful reusuable T-shirt bags!!! Thanks for sharing ...I'll post it on my website at www.freewebs.com/onewildworld...the site is an inspirational link to bring attention to People (Like YOU) making a difference for the bestter quality of life on our blue planet OCEAN! We ALL have ONLY O.N.E* ~ Ocean, Nature, Environment ...lets keep on working on innovative and imagination and great things (like reusable and recyclable materials) to help improve our world O.N.E. Day at a Time, EVERYDAY!!! THANK YOU for Caring too! Yours Sincerely, Leona Hedrick Friedley and Family O.N.E.W.I.L.D.W.O.R.L.D. ~ Oceans, Nature, Environ, Wildlife, Indian River Lagoon (Estuary of National importance) Dolphins, (clean) WATER and ALL resources that connect us to our very healthy , quality of LIFE on the Blue Planet we call Earth/Ocean! Just goes to show it doesn't pay to be too far ahead of the crowd. The concept of shopping bags made from old tees was invented by a fourth grade boy -four years ago, in 2007. http://www.fashion-incubator.com/archive/reusable_bag_contest_1/ His mom (Abigail Vargas) was reluctant to enter the reusable bag contest with his idea (she won) because they thought the idea was "too corny". Poor kid. Of course today you see it everywhere with no provenance given. If you liked the T then why not make it into a bag? Reduce the waste and reuse the item for something else. Absolutely BRILLIANT!!! Love this idea!!!! Love it! Old tshirts meet farmers market! Any ideas to make a handle on this bag other than a draw string through the hem? I would like a little something more substantial. I just left a little extra at the top and cut through both layers making a small semi-circle in the top center. Voila no extra supplies needed. Btw I hand stitched mine. @slimginnn, you could double up the bag i.e. 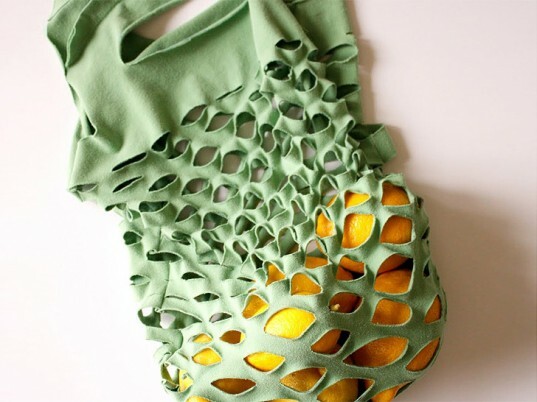 make a bag with two shirts to make it more sturdy. Make decorative slits in one shirt, the other (contrasting color??) can be left uncut. And you could use leftover T shirt neckline to reinforce the handles. About how far apart were your slits? Looks like 1/2 inch, maybe? Thank you. Cut through both layers so you have two identical pieces. You can leave the shirt's hem intact or snip it off. Stitch the two pieces together all the way around, leaving the bag's opening untouched. That's it! If you wash and dry your bag, the slits curl up a bit and it looks even better. You can use them for produce, as the name implies, or at the beach for your sandals.